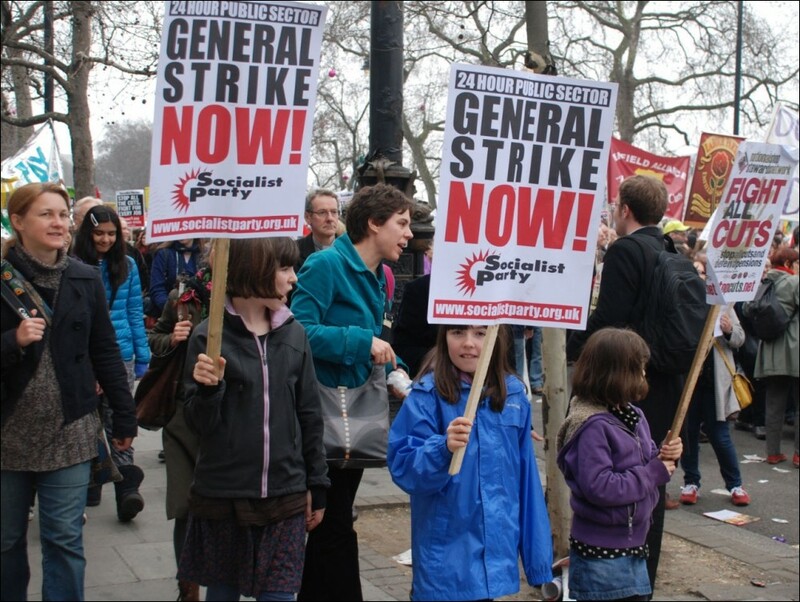 Much of the far left, most prominently the Socialist Worker’s Party, are campaigning for a general strike. This demand often takes various form, but the principle is the same, we need a big strike, the more militant the better. Such demands are beginning to gain traction amongst young radicalised workers and trade unionists, and so it is worth examining whether this call for a general strike is one all socialists should be taking up. Clearly were the unions to bring out all their membership, millions of workers, in an indefinite general strike the country could be paralysed and the austerity agenda halted in its tracks, however the reality on the ground in many trade unions makes this scenario exceedingly unlikely. The difficulty here is tacitly acknowledged by the leaderships of the unions. Whilst they may not be the bold and daring leadership we might like they are none the less genuinely hostile to the Tories (sometimes for ideological reasons, sometimes because their future career as an MP depends on Labour being in power). Yet they are unwilling to take up the calls of the far left for a general strike. This is not simply cowardice, the union leaders know that behind the often inflated membership statistics lies a sorry picture of union organisation. Besides the already well documented ageing and decline of trade union density most trade unionists will not have been on strike in years. A decade of “partnership” with the bosses has done its damage and even those more militant unions who occasionally strike frequently find it is a battle enough to try to get their own union membership out, let alone the workforce as a whole. A general strike then, a decisive confrontation with the government, risks a major defeat for the trade unions, as it was in 1926. Indeed we need look no further than Greece, where several one day general strikes, of the kind advocated by much of the far left, combined with massive civil unrest have thus far failed to stop the austerity agenda. This attitude of trying to mimic those tactics which are seen as most militant, which appeal aesthetically to idealistic young activists, rather than a focus on the hard work needing put in in the here and now is sadly a trend much of the left is guilty of. This focus on militancy is not simply a distraction, it can often prove quite dangerous. If the far left wins its argument for a piece of seemingly militant action to take place, and that action fails to be effective, militancy will be discredited in the eyes of all those who participated. Workers are not going to hurry to try another workplace occupation if the last one got half of them fired. Yes, we should be arguing for bold tactics such as sit-ins, wildcat strikes etcetera, but only where these tactics will bring us victories. The principle of fighting to win must take precedence at all times over a preference for aesthetically militant action. Of course a hugely important factor when fighting to win is ensuring that whichever tactic we ultimately adopt has the support of the vast majority of those involved in the fight. Again here the far left’s attitude of militancy for militancy’s sake can prove dangerous. A workplace occupation will be destined for failure if we only manage to win a small proportion of the workforce to this tactic. Consequently, when propagandising to the whole of the labour movement we need to be concious of where that movement largely is, and what sort of actions are likely to win mass support as opposed to isolating the far left in its own militant bubble. This of course does not mean that we need be bound by lowest-common-denominator passivity. We need to move the labour movement in a generally more militant direction, but any attempt at this must begin with where the working class is currently at, and must build the foundations, the membership density, the buy-in, that make successful militant action such as a general strike possible. A large section of this post was originally part of a larger “how can we beat the cuts” article written in conjunction with others for Liberty & Solidarity which can be read here. This entry was posted in Uncategorized and tagged General Strike, Strategy. Bookmark the permalink.